Joey Dunlop remains the most successful Isle of Man TT rider ever with 26 victories. The event, showcasing classic racing motorcycles and starring some of the top riders past and present, will be held at Bishopscourt in County Down on August 4. Phillip McCallen on a Joey Dunlop 125cc Honda at the Irish Motorcyclist of the Year awards in January. 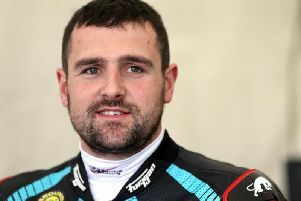 Multiple North West 200, Isle of Man TT and Ulster Grand Prix winner McCallen was inspired to host a major classic bike festival in Northern Ireland following the success of similar events such as the Goodwood Festival of Speed and the Festival of Jurby on the Isle of Man. The Portadown man says it’s all systems go for the summer spectacular after receiving the green light to press ahead with the event, and McCallen is determined to bring together the biggest collection of Joey Dunlop machines ever seen at one time. “One of the exciting things we do want to do – and we’re well on the way at the minute – is to put the biggest collection of Joey Dunlop bikes in the world in one place at one time,” McCallen said. “We’re hoping to put those bikes together in one of the greatest displays ever of Joey Dunlop bikes. Also, we hope that the bikes that are still running will also do parade laps. Providing the latest update on plans for the festival, McCallen said: “We’ve been waiting a long time for a Classic bike festival in Ireland and we’ve got them all over the world with Goodwood, Jurby on the Isle of Man, the Festival of 1000 Bikes; so everyone has got one, but we here in Northern Ireland and Ireland probably have one of the best collections of bikes in the world. “We’ve got historic bikes, famous bikes, Joey Dunlop bikes, Tom Herron bikes and many, many more. “So someone had to put an event together to get them out and I’ve teamed up with a partner and we’ve created a club to do that. McCallen is also working behind the scenes to bring in a leading rider to be an ambassador for the festival and hopes to be able to make an announcement soon. “I work with a lot of famous riders who I’m talking to at the minute and I can’t confirm names at the moment – I would love to – but there are dates and clashes, although I am talking to three or four top guys at the moment who would be ambassadors for this event,” he said. “Hopefully in the next four or five weeks we will have that person confirmed.